Crafting Queen: Another challenge card! Firstly a very happy friendship day to the lovely ladies i have as friends here! Craft JC Challenge - well it goes with the sketch! Karuna, I have been following your blog and love your talented quilling -- you have such beautiful and detailed creations! 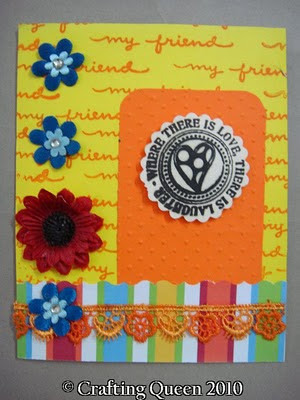 Happy belated Friendship day -- I love your card creation - beautiful blend of embossing, embellies, DP, and dimension. Ironically, I was going to see if you'd heard about "A thousand sheets of paper" and then saw in your mini post that you had - wishing you all the best - so great that she ships anywhere! wow!! such cute & bright card.. that myfriend paper in the back is nice! Lovely n bright card. I like the colorful strips pattern paper at the bottom.